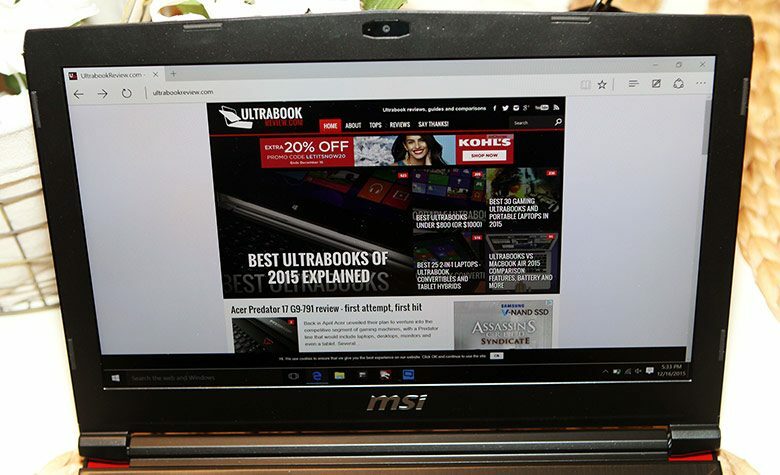 Summary: I think those who prefer a small and powerful laptop will appreciate what the MSI GS40 has to offer. It certainly delivers in terms of hardware specs, performance, cooling solution and screen quality. And is certainly fairly priced, but the keyboard and the speakers are two important aspects that might turn your towards something else. 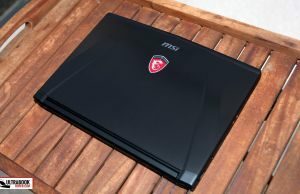 I’ve been a proud owner of the MSI GS60 for about 18 months now and I’ve shared with you the impressions on the model that I still use, but also on one of the updated models with the 4K display. Because of its powerful CPU and GPU in such a thin and lightweight design, it has completely replaced my desktop for both productivity and gaming. Of course, as things progress, good things are bound to come in even smaller packages. 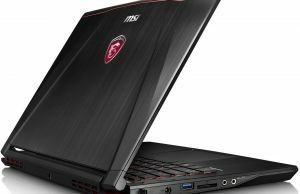 Enter the MSI GS40 Phantom. I’ve been looking at this machine in anticipation for a few months now and have finally gotten my hands on one for a few days. 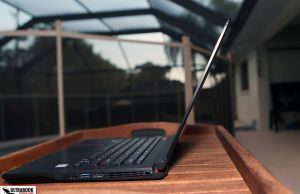 Does it live up to the GS60 in terms of quality and performance? Is it enough for me to trade up? See the detailed article below for my answers. 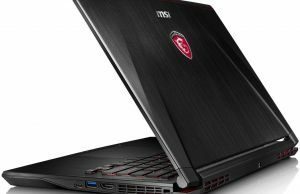 Update: We’ve also reviewed the MSI GS43 Stealth Pro, the updated version of the GS40 with Nvidia GTX 1060 graphics and faster RAM. The GS40 has a striking resemblance to the GS60, but in a smaller footprint. The lid appears to have the same brushed magnesium alloy and also has a couple ridges for a special look. The top edge is plastic, which might be for Wifi antenna purposes and is separated from the metal with a red border. In fact, red is pretty much the highlighted color all over the laptop, but MSI managed to keep it pretty subtle for the most part and to me it looks quite nice. What’s no so subtle is the same “Gaming G series” dragon shield adorning the lid (which I hate btw). Not only does it glow with the backlight on your screen, it also sticks out a couple mm – so there is no way to shut it off or cleanly cover it up with a decal. The build quality is pretty solid for the most part but I’ve definitely felt better. It feels good in the hand, being an appropriate weight and not overly thick. 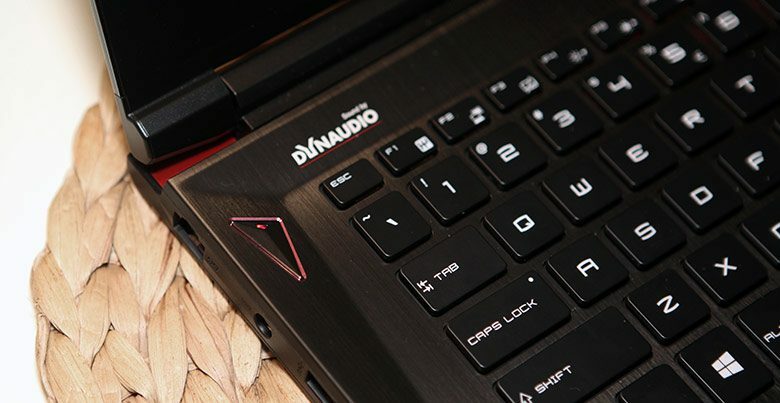 Weighing under 4 pounds is a real plus for a high end gaming laptop. It’s a little thicker than my GS60, but nothing I can complain about. 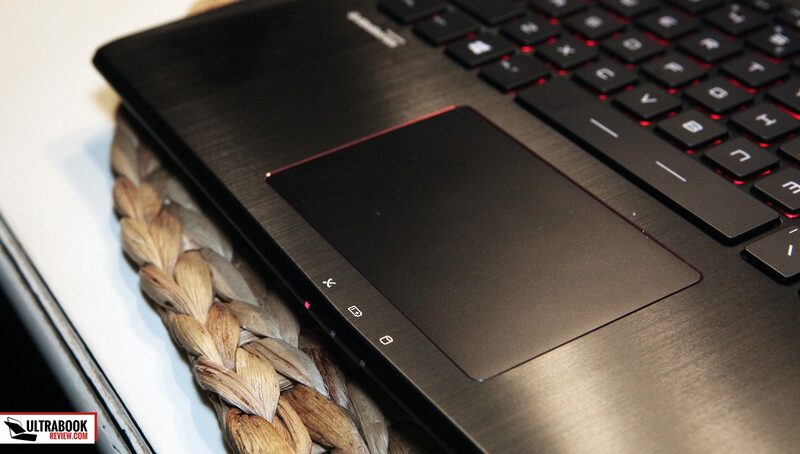 To be honest, it feels a lot like the Lenovo Y50, which I really liked, except for the awful screen. When holding it, I did feel the lid flex a little, which I don’t really like all that much. It’s certainly something I could get used to, but I think it could be better. Also, you might feel a little flex when grabbing it on the rear end with all the vents, but it really depends how tightly you hold it. One thing I want to note is my unit weighed just over 4 lbs, contrary to 3.75lbs MSI advertises. This makes it only 5 ounces less than my GS60. If there’s anything I can get nitpicky about, it’s the lack of a tapered contour. I literally needed to use two hands in order to pick it up – something I often found annoying. I don’t think I’ve ever paid attention to it before, but one-handed lifting is something I would expect of a laptop so thin and light. 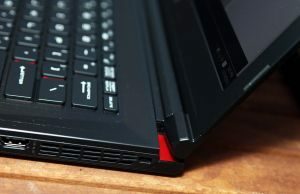 I think most laptops have a tapered lip in the front at least – something to get your finger under and lift it a little. Or maybe even more of a gap with the rubber feet would help. Maybe I’m too picky, but I thought it was worth noting. Looking from the bottom, it appears to be made out of plastic, but I couldn’t verify it since I wasn’t allowed to open this one. It’s a pretty stylish underside though, with some red accents on the vents of both sides. The look gets ruined though by the absurd amount of stickers they put on the bottom. You can peel them all off, but it’ll affect your warranty considering one of the stickers has your S/N and the other is specifically a sticker that says void if removed. 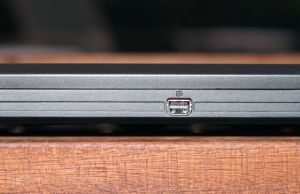 On the right side of the laptop, you have the intake vent, an HDMI port, a single USB 3.0 port and a USB 3.0 type-C port. On the left hand side, there’s an Ethernet jack, power connector, USB 3.0 port, SD card reader, earphone and mic. 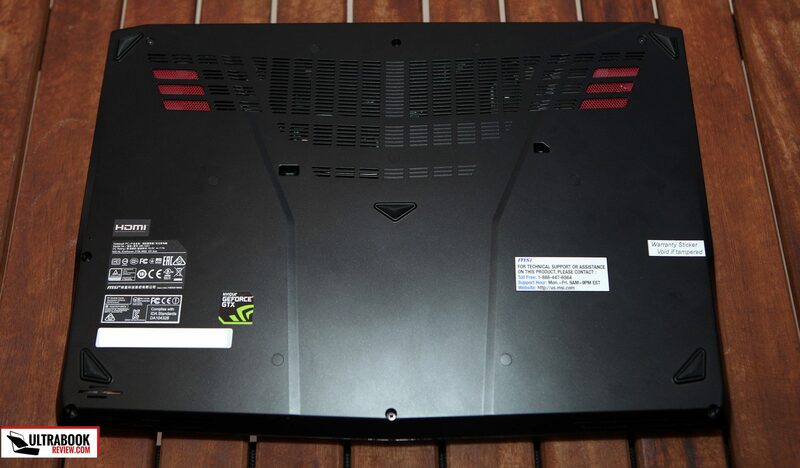 The rear offers a single mini-display port and both exhausts for the CPU and GPU. 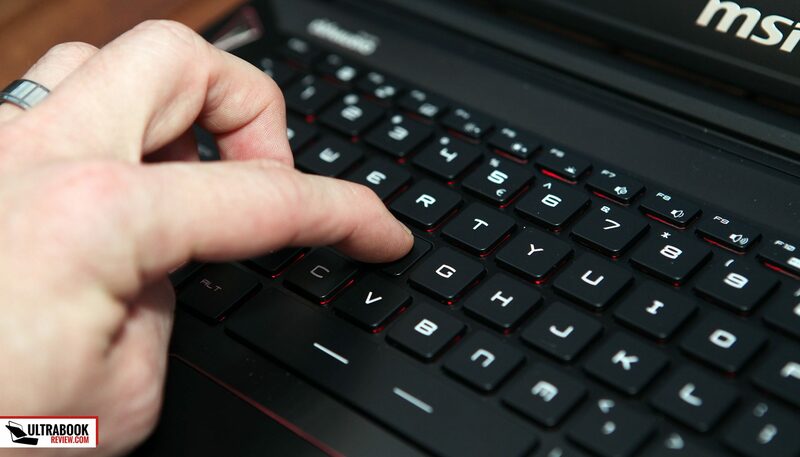 Opening the lid with one finger is a cinch and under the hood is your typical keyboard layout. This keyboard is recessed a little but it’s pretty subtle, as the metallic palm rest is only slightly angled to give the keyboard some spacing from the screen. Unlike other MSI laptops, the Windows key is located on the left side on this one. Directly beneath the spacebar is the trackpad. I’ll cover the keyboard and trackpad in more detail later, but the trackpad has a pretty nice red border around it to match the accents on the rest of the machine. The power button is on the upper left corner. It may look a little funny to some, but it’s nicer looking than some of MSI’s past choices. The LED indicator is a single light and isn’t all that bright, but bright enough. It glows red when running on integrated graphics and then turns orange when the 970M picks up the load. It’s a VERY difference between the two, especially when you compare it to the blue/orange power button of the GS60. The amount of branding on the laptop is pretty aggressive. 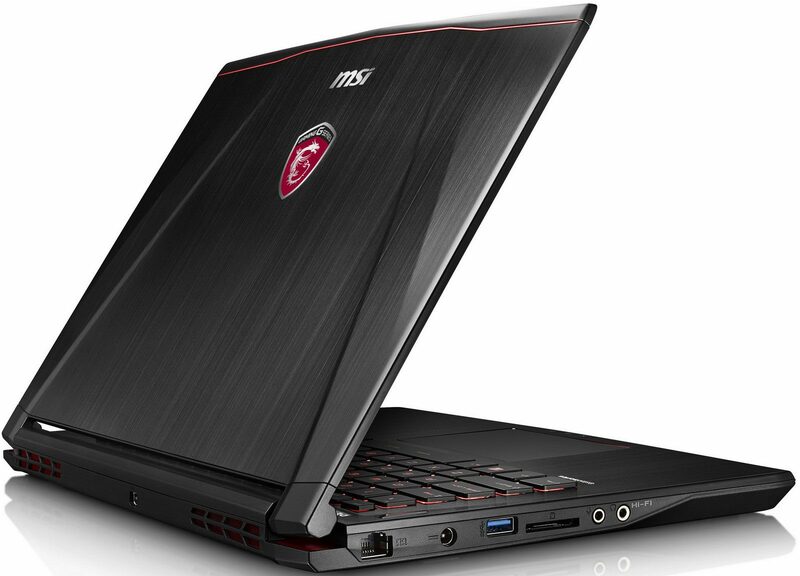 There are two MSI logos – one on the lid and the other below the screen. A “Sound by Dynaudio” logo is painted on the metal above the keyboard and “keyboard by Steelseries” is painted below it. I was able to remove these logos, on my GS60, with some acetone, so I assume they could be removed on this GS40 as well. The Intel sticker is located on the lower left of the keyboard, which is also removable. Of course, as I already mentioned, this is all in addition to the many stickers on the belly and glowing dragon logo on the hood. The GS40 comes with a SteelSeries branded keyboard. On the outside, it looks exactly like the GS60 keyboard, but unfortunately it falls a little short in terms of performance, which I’ll get to in a minute. The backlighting is red in color and cannot be changed, unlike most other MSI keyboards which are chroma. The layout is pretty typical for your average 13 or 14” laptop, with no keys in any unusual spots. The keys are pretty well spaced apart and the travel is also normal, but my typing was still a little lacking, which I noticed right away. Don’t get me wrong, it’s far from bad. I just found this disappointing since I love the GS60’s keyboard and the GS40’s keyboard just isn’t as good. I decided to dig deeper to find the difference and I can only attribute it to the amount of force needed to depress the keys. On the GS60, the force needed was 65 grams while on the GS40 it was only 50 grams. This is my first time measuring this, so I don’t know what’s appropriate, but I like the feedback of the GS60 keys a lot better. 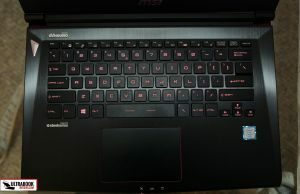 The font on the keyboard is a little strange and will take some getting used to, especially if this is your first MSI notebook. The backlighting is pretty bright and can be adjusted to 3 brightness levels via Fn hotkeys. Looking head on, there’s no visible light bleed, but you can certainly start to see it when looking at the extreme angles. It’s certainly nothing abnormal to look at. At first I was disappointed that the keyboard was stuck at the red color, but I think they made the right choice in the end. It really adds to the look to keep a consistent color scheme with the laptop. The only other notable thing for the keyboard is the ability of control through software. In the Steelseries software, you’re able to disable the Windows key, on demand. You’re also able to create custom macros for just about any key combination except for the Fn key. This is especially useful for games. My keyboard unfortunately came with a defect and it’s something you’ll want to look out for as well, if you choose to purchase this laptop. On mine, the tab key has a tendency to click and sometimes even stick. And when it sticks, it can’t be pressed again. It’s not something I think I can fix and I definitely couldn’t live with it since I use the Tab key so often. I did check the forums to see if anyone else had the issue, but nobody spoke up – so there’s that. 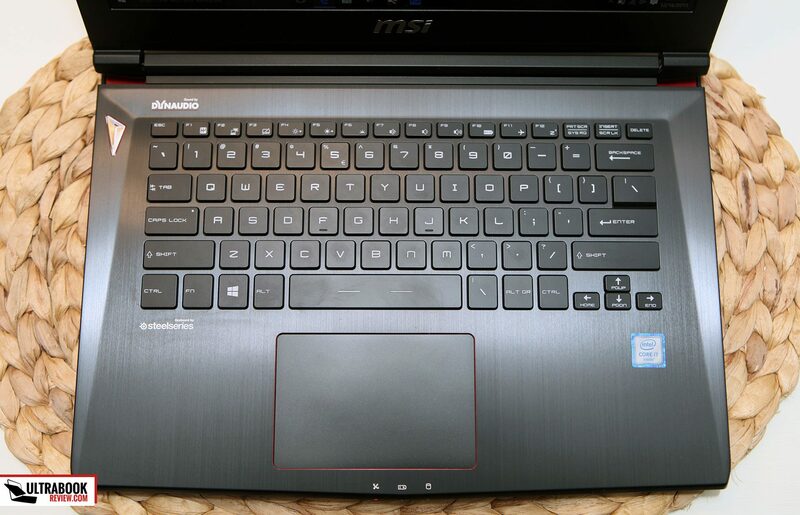 Onto the trackpad, MSI has improved in this department compared to their previous iterations. The trackpad surface is still plastic, but it is much smoother than the previous ones I’ve used and feels more premium. This trackpad is a clickpad type, with right click built into the lower right portion. Overall, tracking and scrolling was smooth and accurate, but there are a lot of adjustments that I needed to make in order for it to feel “just right”. Luckily the included Elan drivers have a lot of options to customize. The only thing Elan lacks (and this is across all devices) is support for the advanced multi desktop/app switching gestures in Windows 10. Something I can live with, but I’d like to see this implemented in the future. The model I received has a 14” 1920×1080 resolution panel. 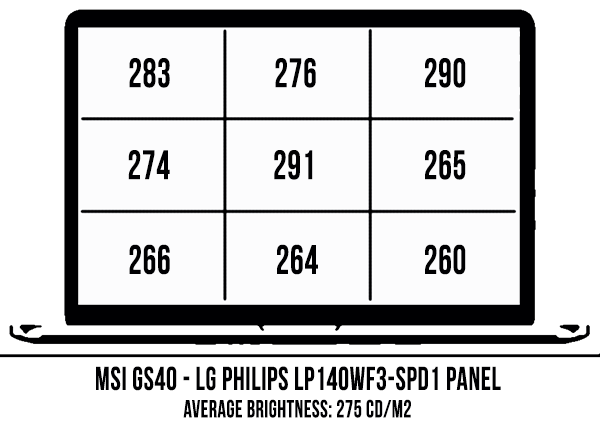 HWinfo says it’s an LG panel with the model number LP140WF3-SPD1. It’s a matte display, so reflections from ambient light are properly dampened. It’s also an IPS display, so the viewing angles are fantastic. As far as matte FHD panels are concerned, there’s not a whole lot I can complain about, really. The only complaint I can note of is the backlight bleed I can see in the upper right hand side of the panel. It’s going to vary from unit to unit, but I’m going to guess that some backlight bleed will exist on everyone’s version. The cause of the bleed is almost definitely from the lid being so thin and the mediocre support of such a thin plastic bezel. These IPS panels are prone to backlight bleed if there’s even the slightest bend in the panel. To further prove my theory, if I push or pull the lid from that corner, the backlight bleed disappears and shifts to another portion of the screen. Note that this is only noticeable on a black screen in a very dark room. In no way can I see this light bleed in daylight or on a non-black screen. Aside from that, the picture is very nice for a FHD screen, having nice colors and proper contrast. I took some measurements using my colorimeter and the gamut measured to be 91% sRGB, 68% NTSC and 71% aRGB. I’ve seen many panels get a sRGB closer to 98%, but I really can’t tell the difference with the naked eye. Other specs I measured was a contrast of 620:1, maximum brightness of 292 nits and blacks measured at .47 nits. These are all pretty good values, although I so wish the screen could be a little bit brighter for outdoor use. Black on max brightness: 0.47 cd/m2. I also checked the brightness distribution, which you can see the results below. The bottom of the screen is a little lower in brightness than the upper parts, but it’s very minor and almost impossible to see with the naked eye. These measurements are also at maximum, so they’ll be much closer together, the lower in brightness you go. 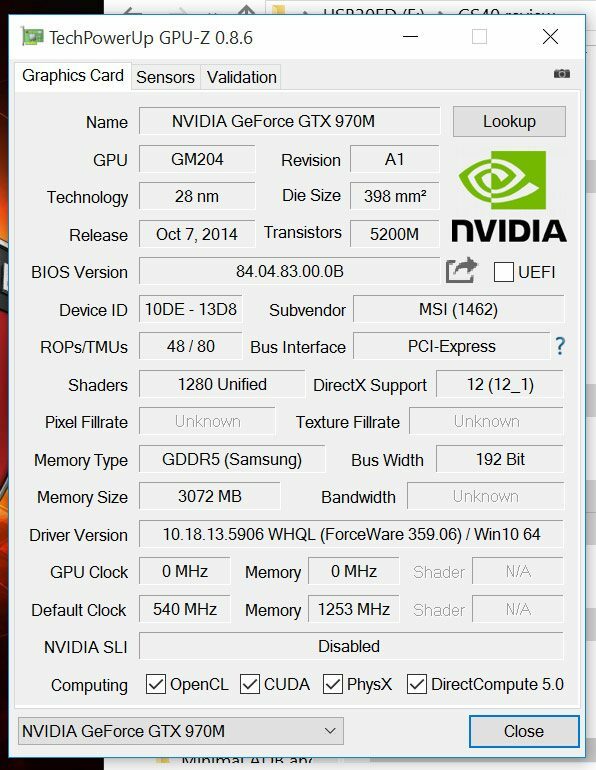 My GS40 came fully loaded with an i7-6700HQ quad-core CPU and an Nvidia 970M GPU. I haven’t seen any other configurations out there yet, but they may possible offer a 965M version like they did with the GS60. My unit also came with 16GB of Ram, which seems to be the standard now for gaming laptops. What’s nice is it’s DDR4 2133 MHz, so there’s little need to upgrade it any further. I have no way to confirm it, but this laptop should support 16GB sticks, so you could potentially go up to 32GB of RAM if you desired. Also equipped in my unit was a 128GB M.2 SSD and a 1TB 7200rpm HDD. Thankfully, the M.2 slot is PCI-E, so your R/W speeds are phenomenal (which I cover below). Unlike the previous gen GS60s, there’s no second M.2 slot though. I was pretty bummed about this with the Skylake GS60 as well, since it removed the ability to have a third storage drive. MSI probably removed it since the need for RAID isn’t there anymore with the PCI-E slot. If you’re like me, you’ll probably look to replace the HDD with a SSD right away, since that 128GB is going to fill up REAL quick. Cinebench R15: OpenGL – 58.92fps, CPU – 680 pts, Single Core CPU – 142 pts. Fallout 4– Ran from one end of the Commonwealth to the other, constantly looking and shooting all over the place. Ultra settings, Max AA and AP 1080p – 45-60fps with occasional drops to 35fps. Fully playable. Default high settings 1080p – 50-60fps with occasional drops to 40fps. Crysis 3– Played through the opening scene for 10 minutes. Dragon Age: Inquisition – Walked around one of the first camps and got into a battle. Played for about 10 minutes for each session. As you can see, the 970M in the GS40 is able to handle even some of the most demanding games. It helps that the screen is limited to 1080p too, considering how I’ve witnessed the 970M struggle with 3k and 4k resolutions. You should also know that the size of the screen is going to affect how much you can tell the difference between your graphics settings. For example, in Dragon Age, I couldn’t tell the difference between high and ultra settings at all. And given that it’s a difference of 20 fps, there’s absolutely zero reason to keep it on ultra. Unless you’re outputting to an external display, you might want to consider dialing back the settings to achieve even better performance (and lower temperatures). And now on to my favorite part about the laptop. Many of you will be asking how well the GS40 is able to handle heat dissipation. It’s a smaller footprint and still a pretty thin design, so many would probably expect it to struggle. I’m happy to say I found no evidence of that. In fact, I’ll go out on a limb and say the GS40 does an excellent job at removing the heat. Sure, when gaming, the underside gets hot – but it’s cooler than on many previous laptops I’ve seen. With the exception of the part that never touches your legs (top middle, which gets actually HOT; the exhaust on the back reaches high temperatures as well, around 57 C), the underbelly temps were consistently 5-10°C lower than the Broadwell GS60 I reviewed. I didn’t need a thermometer to tell me that, it felt cooler on my lap as well. In fact, most of my gaming was done on my lap and I didn’t get all that uncomfortable. You can credit the fan and heatsink configuration for the improvements. Instead of having the standard GPU and CPU in single heat pipe lineup, MSI chose to beef up the GPU side and add more copper heat pipes. From the pictures on a disassembly guide, it looks like they have two intake heat pipes going onto the GPU and the fan evacuates half of it while another heat pipe supplies the CPU. The CPU fan then evacuates the heat on the other side. It looks like passive air can be drawing in from the bottom, but the main intakes and exhaust are not on the underside, which is good for your lap. Overall, I give them an A+ in this department. As for physical noise, the CPU fan will constantly run and the GPU fan will stay off until needed. This is the same as many of their other models. I didn’t get a chance to see if their fan tweaking software works for this model, unfortunately. I would assume it does, and if so you’ll be able to edit the fan profile to run silent until the CPU reaches a certain temperature threshold. 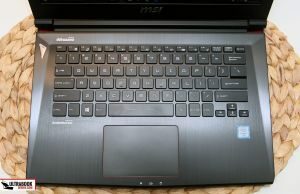 For connectivity, MSI decided to go with the Killer N1525 Wireless AC, which has been a great performer in their other laptop models. For my week of usage, I had a solid connection with no drops whatsoever. From 30 feet from my router, I reached download speeds of over 70Mbps. There is also a Qualcomm/Atheros E2400 Gigabit Ethernet controller onboard and Bluetooth 4.0 included with the wireless card. Speakers – I’ll come right out and say it: the speakers on the GS40 are just plain awful. I thought they would be the same as the GS60, which were decent at best, but they are way worse. The sound is heavily dampened and I even brought my GS60 into the same room and mimicked all the settings to directly compare. It was night and day. Nahimic is the software bundled with this laptop, to help try and improve the audio experience. For the GS60, you actually needed this software to make the speakers sound decent, but it doesn’t do the trick for the GS40. MSI’s marketing literature also speaks of an internal subwoofer, but I found no evidence of one at all. The bass on these speakers is barely existent at all. I played a song off of Youtube and cranked the volume all the way up and the maximum reading I got was a mere 44dB. For comparison sake, the same song on my GS60 measured about 75dB. For people who use headphones (which is probably most gamers), this will not be an issue at all. For people who don’t use headphones, I suggest you invest in a pair, if you plan on buying this laptop. When you have fans that make 40dB and speakers that only go up to 44dB, you won’t be hearing the game you’re playing all that well. My battery test consists of using the stock “Power Saver” power profile, 30% brightness(80 nits), WiFi off, Bluetooth off, and running a 720p movie in a continuous loop at full screen with the volume muted. I start the clock when it’s unplugged and stop it when the unit performs a self- shutdown. This GS40 lasted 5 hours and 37 minutes before shutting down. This is pretty impressive when comparing it to the GS60. Overall, battery life is pretty decent on this machine, considering it’s using a quad core CPU that isn’t designed for power savings like the Ultrabook CPU models. It’s certainly a step up from the GS60 and is about on par with Gigabyte’s P34W and the new Razer Blade. 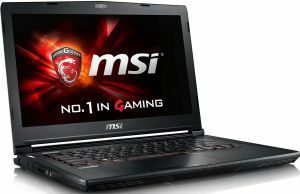 The GS40 970M model I have is priced at $1599 USD and can be bought from both Amazon and Newegg. It’s a pretty good value considering the price of the similar specked Razer Blade and the GS60. I haven’t seen any other configurations other than the one I currently have, but I’ll be sure to keep you all informed if I see any. Overall, I’ve got mixed feelings about the GS40. It certainly has it where it counts in terms of hardware and performance. 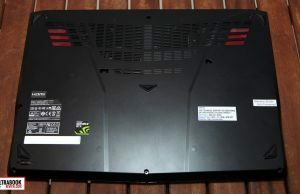 The cooling capability is also almost ideal, considering it has a 970M inside. I haven’t personally handled the new Razer Blade, but from what I’ve researched, it’s about the same in terms of cooling. I’m also very impressed with all the connectivity options and multiple hard drives being in such a small package. These things really make it shine over the Razer Blade. I do wish they would have improved the performance on the keyboard though, and I think it’s the one of the two faults of the machine that I can really ding them for. Sure, I’m biased from using the GS60, but I know the potential is there and I would expect to receive it in my future purchases from MSI. The other fault being the poor speaker performance holds less weight to me, but it’s certainly something you all should think twice about before purchasing. This is especially if you plan on watching movies on it and using the internal speakers. I can honestly say I would never use this laptop to watch a movie without headphones. 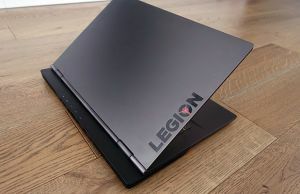 If I were in the market for a 14-inch gaming laptop, this one would certainly be in my top three, especially considering the price is considerably lower than the Razer Blade. The Gigabyte P34W would also be on my radar though, because it has almost identical specs and is $100 less. Of course Gigabyte laptops also have build quality and keyboard issues sometimes, so there’s that. 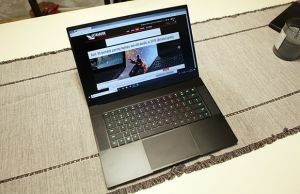 The Razer Blade offers much better build quality, a better screen (and a touchscreen for that matter) and a Thunderbolt 3 port, but prices start near $2000 and it only offers M.2 SSD Storage, with no 2.5” bay. In the end, I think most people’s decisions would be driven on the specs and the price. For me, if the keyboard was the same as of my GS60, I would consider converting – that’s how close I am to liking it. 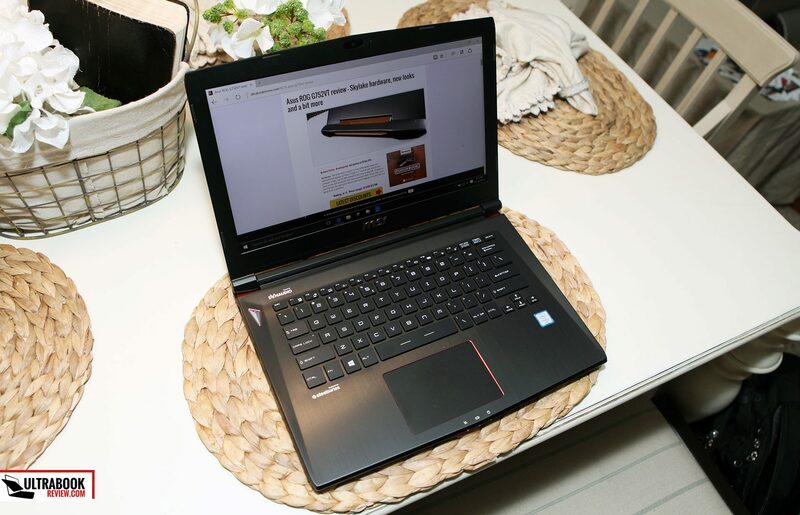 It’s not though, so I’ll be sticking with the GS60, but I think many of who who prefer a smaller laptop would be fine with what the GS40 has to offer. If you guys have any questions or need me to clarify on anything, please leave a comment below. Also, if you’re an owner of the machine, I’d like to hear your thoughts on how you like it. First of all, this is a great review. This is the only decent review I found for the laptop. Thank you a lot. I have a question about emission. You reported max 58.5C surface temperature and max 86C (CPU) internal temperature. 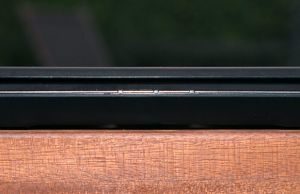 In contrast, the Razer Blade 14 is reported to have only max 51.6C surface and max 90C internal temperatures (http://www.notebookcheck.net/Razer-Blade-14-Early-2015-Notebook-Review.138997.0.html). Razer Blade 14 seem to have overheating issues if you look at user reviews (e.g., https://insider.razerzone.com/index.php?threads/regarding-blade-2014-heating.4600/). gs40’s surface temperature seems to be considerably higher compared to laptops of the same class (Aurus X3, P34V). Does it mean that gs40 may have the same overheating issues? Is it possible that internal temperature of gs40 may be higher than reported here because 58C of surface temperature feels a bit too much for me? I didn’t see any throttling with the GS40, as it was well below the thermal limit at 86C. I’m not sure if the Razer Blade throttles either because 90C is also under the 970M thermal limit. If by overheating, you mean it gets really hot, that’s just the nature of having a thin laptop with a powerful GPU. There’s really no way around that except by having a good ventilation lineup or a thicker chassis. I never had the new Razer Blade so I can’t compare Apples to Apples, but what I can tell you is the amount of heat pipes in the GS40 are more than in the Razer Blade, which probably accounts for some of the internal temps being lower. Also, the intakes aren’t primarily on the bottom like they are in the Razer Blade, so playing while it’s on your lap isn’t going to affect the temperatures as much. You should also take into consideration that I did all my testing on my lap and notebookcheck probably did not, so there might be some differences in our readings there. One more thing – unless you balance the laptop on one knee, you won’t feel that 58.5C. That’s literally a single hottest spot smack in the middle of the top portion and the temperature drops big time moving just a cm away from it. Manufacturers typically ignore cooling that spot since it’s typically not in contact with your knees. I played lots of games on my lap and found it tolerable. I even find the GS60 tolerable though, so I might just be immune to it. Of course, I had the 870M versions of both the Razer Blade and the GS60 at one point, and they were both frying pans – so coming from that, I’m a little biased. Thank you for your excellent reply. I think you are correct. I did some more research, and it seems like gs40 indeed is good at keeping internal temperature low. It is just that are at the center where heat leaks to the surface. It may result in sweaty hands during prolonged gameplay but probably will not adversely affect longevity of the laptop. Thanks for the review! I am currently debating between the GS40 and the new P34Wv5. Are you planning on reviewing the new P34W anytime soon? It is a nice looking machine though. Hopefully I can try one out sometime soon. 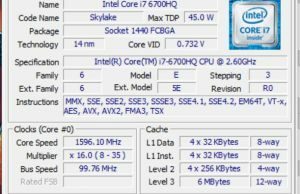 Beyond performances i’ll never buy an MSI machine anymore. 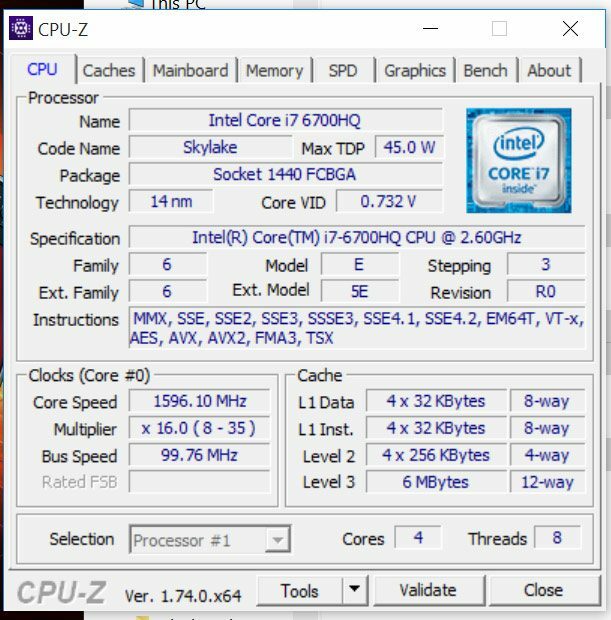 I live in Taiwan and have bought a GE72 Skylake. It never worked due to constant blue screens popping up all the time, Bad memory configuration, Hardware issues etc. popping BSODs like a Xmas tree. MSI refuses to change it because for them the machine is “OK”. At those prices i’d rather go with something else. Sorry for the rant but this brand doesn’t take quality checks and service seriously. This shows in the endless queue i had to endure when i went to take my PC to the service center. Lucky me i got a chance to exchange that scrap with anything i want, by kind concession of the shop. I bought the gs40 from exotic pc. Speakers aren’t a big deal to me, if I’m gamming I’m using headphones, but yes, they are horrible. 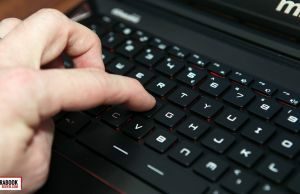 One thing I disagree with –I actually think the keyboard is pretty darn good I’m used to a Lenovo think series keyboard, so I was expecting to be disappointed. I hate chicklet keyboards .. the only one I’ve every been able to touch type on successfully was the MacBook and the razer. I found the feel, feedback, spacing, and overall quality of the gs40 keyboard to be fantastic. I went from years of touch typing on a t-series Lenovo the gs40 keyboard with very little adjustment (aside from everyone putting the ctrl and fn keys in the incorrect spot, as opposed to Lenovo’s placement, where God intended them to be). So, to anyone considering this laptop, I don’t think the keyboard is a negative — I actually think it’s a positive. anyway, I as for the logo — that was a huge deal for me as well. Ibought mine through xoticpc, and they did a vinyl wrap for an extra $30 that just covers the logo. I think it looks great, and I have no problems brining it into client meetings or using it in business settings. the wrap is neat, covers only the logo, and completely blocks any glow from the screen backlighting. Last thing I want to mention that wasn’t in the review– this is one of the few laptops out there that have thunderbolt 3. This was also a big deal for me– thunderbolt 3 was a massive deal at CES, and we’re starting to see commercial thunderbolt 3 docks with e-graphics, networking, etc. TB3 will be on just about every skylake laptop in the near future, and if you’re considering a laptop, I wouldn’t even think about getting one without this port. also, another thought — If for whatever reason you’re looking for the highest-performing 14″ laptop, and also want something lightweight, and actually need something that is useful in everyday business, this is imho, is one of, if not the best laptop– I drag this everyday into work for the past two weeks, plug it into into an old thunderbolt dock (which will be replaced with a tb3 dock as soon as they come out). even if I didn’t have a tbolt dock, it has enough connections to support three simultaneous external monitors. It’s hands-down the lightest skylake 14″ laptop out there.. 3.7pounds. 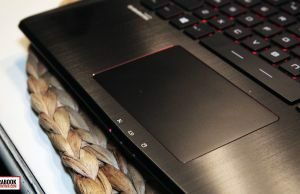 No other laptop out there offers this combination– saeger offers skylake and similar connectivity (no tbolt though) but is a masasive 5 pounds. You mentioned gigabyte, which I gave serious consideration to, but it doesn’t have a thunderbolt port (a serious omission imo), and from reviews I’ve read, has throttling issues (which I would have confirmed for myself, but the lack of t-bolt was a deal breaker for me). The razer sure is a nice laptop, but they don’t have a skylake model yet, and the 14″ model they do sell doesn’t have Ethernet, thunderbolt, and a few other ports included on the MSI. anyway, the MSI to me hits a niche not hit by anything else out there… it’s crazy light, has a massive amount number of outputs, runs cool under everyday use, and again, I disagree with you on the keyboard .. I think it’s a joy to use (maybe you had a bad sample)? 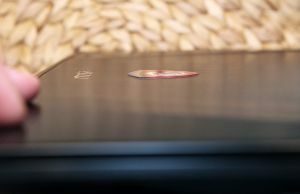 I just wish MSI would realize this and produce this laptop with a more subdued tone — the logo on the back really was a deal breaker for me (imaging running into court with a flaming dragon on your laptop..), but the vinyl wrap from exotic really gets rid of the issue. I agree that the dynaaudio/keyboard by steelseries labels are a little gaudy.. IK had assumed they a glazed sticker or something, you were able to get this off with acetone on your gs60? did it mar the finish at all? No, I don’t even notice it anymore. It’s been heavily used though and probably needs a good wipe down though. :) If you do it, start small though – maybe with the “sound by” just so you know what it will look like. Hi Jimbo, can I ask, you mention putting wrap on the GS40 to hide the logo? I am consdering a GS40 for business use but want to hide the logo. xoticpc. or something like that. I'm using it right now, wrap is still on with no problem. I take it to court, to clients, with the wrap it actually looks very sedate and unassuming. But get the updated version of it — they're selling a 14" with a 1060 nvidia card. Still the same processor (6700) I think, which is still top of the heap for laptops. also, if you're getting this, one fantastic upgrade — get the razer power supply. It works perfectly with the MSI, and it is about half the size and weight. The power supply that ships with the MSI is almost comical how large it is. the Razer is almost svelt — and it has no problems keeping up with the MSI's power demands. I would consider it a must-have if you're going to be doing any kind of business travel with the MSI. the Razer power supply is expensive though — I think I paid $120 or $150 for it. Be careful with power supply, the MSI one delivers more amps. I have a slimier power supply that I use in the office, but if I launch games the power supply is not powerful enough so battery is discharging even if I am on my power supply. 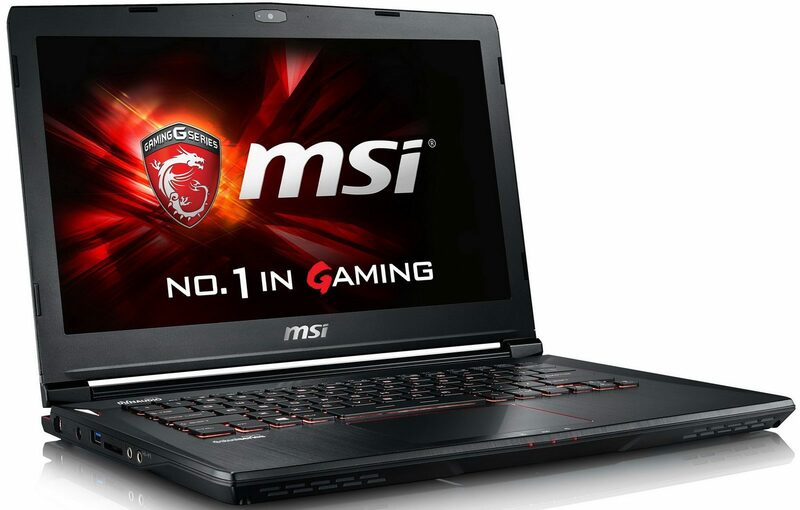 (msi gs63). I do understand what stephane is referring to, basically if the current draw exceeds the capacity of the adapter. Yeah, I didn’t mention Thunderbolt because at the time they weren’t advertising it as such and I had no way to test the bandwidth. Nice to know that’s what it really is. That gives me hope that the Gigabyte P34W and others with the 10GB/s usb type-c connection might be as well – they just haven’t gotten it certified yet. Don’t get me wrong. As I noted in the review, I don’t think the keyboard is that bad. I just think it’s a step down from the GS60 which is unfortunate. I was also able to touch type on the Razer Blade and Macbook Pro pretty easily and could also do the same on the GS60. Minus the odd key placement on the GS60, I liked all three pretty equally. But the GS40 just didn’t measure up and I’ll admit I was certainly expecting the same performance considering it carried the same branding and is made by the same manufacturer. There is a chance I god a dud – especially considering the sticky, clicking tab key. I just received one of these today and had the tab issue. Seems like a manufacturing fault with some machines? the current version of gigabyte, clevo, and aurous all have usb c, but I’ve confirmed that non are implementing the t-bolt3 standard on them. The reason MSI never advertised tbolt3 in the beginning was that they were still getting certification— but if you look even at their early specifications, the “superport” was always advertised as 40gb/s. Clevo, aorus, and gigbyte all say their ports are “10gb/sec,” and I have emails from all except clevo confirming their “c” ports are only implementing usb3.1, and not tbolt3. I’m sure this will change with future releases when manufacturers realize how amazingly useful this port is going to be. Also, if you want, I can forward you a pic of the lid of my gs40 with the vinyl wrapped logo. Really completely changes the laptop, imo. I’m seriously considering this and would appreciate very much if you would post the pic with the vinyl wrap, as I’d be using it for scientific purposes where 32GB RAM and a video card would be great, but bringing it into scientific meetings….requires a serious look. Great review! What ssd would you recommend to replace the hdd? 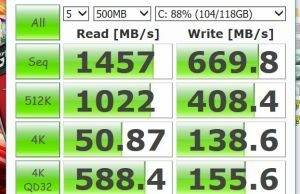 Honestly, unless you’re really trying to maximize the performance of repetitive tasks and seconds are valuable to you, most of the 2.5″ SSD perform really well and about the same these days. For me, I use a Samsung 840 Evo 1TB. There are better options out there now but that one has suited me just fine. Now that you have handled the new razer blade 2016, would you prefer it? There is a significant price difference ( looking at the balde with 512 ssd). My 3rd option being the Dell XPS 15, a real 15 inch screen in the same size laptop… but tot he cost of a gtx960. Any idea if Dell will upgrade anytime soon? If money was no object, I would never choose the GS40 over the Razer Blade. You’re getting what you pay for with both though. 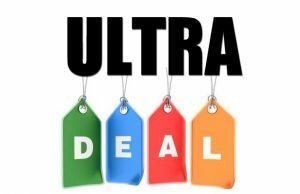 That extra price bump buys you a touchscreen, better battery efficiency and a more portable design. Of course you lose disk options by going the Razer route as well. I think I could certainly live with the GS40 if I had to save the money. 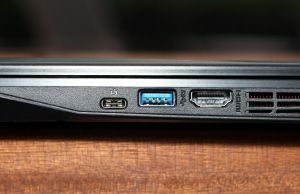 * The MSI has a wired Ethernet port, 2 usb 3.0 ports, 1 usb 3.1 type c, hdmi, and thurnderbolt. The Razer lacks Ethernet, and has no usb 3.1, and no sd ports. 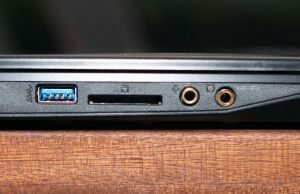 NOt a big deal if you’re just looking for a gaming laptop, but if you actually need to do serious work, lacking these ports is a big deal. * The MSI manages to pack all of this into 3.5 pounds. The razer weighs 4.25 pounds. Again, a huge deal if you’re looking for a dual-use laptop. If you’re looking for a real dual-use laptop, the msi is hands-down the winner. It weighs less, has more useful ports, and has the same performance. I don’t see how the razer is “more portable”. both have the annoying addition of a wonky logo on the lid, but at least with the MSI you can have it vinyl wrapped. just to be clear, I’m not an msi phan-boy– I looked hard at the RAzer, and to be honest, tried everything I could to justify getting it-I would have been more than happy to pay for it. it is simply a beautiful, stunning laptop. But the lack of ports and weighing in almost a pound heavier than the msi were deal breakers for me. But again, this is all very subjective. I travel a lot, and carry this thing around everywhere. An extra pound here and there adds up. The razer is hands down the prettier of the two, so if you’re looking for something that’s a good gamer, I think the Razer is superior, but it just doesn’t cut it as a dual-use lappy. And by the way, the charger for the Razer is amazing– it weighs half as much as the MSI charger, and is smaller (and doesn’t trip circuit breakers on airplanes like the MSI charger). If you go with MSI, do yourself a favor and pick up a charger from the Razer store. Yeah, I agree, the lack of ports on the Razer is kind of annoying. The weight difference isn’t all that much different though. I put the GS40 on a scale and got just over 4 lbs. Add in the chargers and I bet the GS40 weighs more than the Razer Blade. On top of that, the lid flexed and there was more plastic on the GS40, so that kind of explains why the weight is a little less. But again, you’re getting what you pay for in build quality. I can’t really comment on what you read on the battery life though- I just don’t know what they tested. I’ve tested the battery on both laptops pretty thoroughly and I didn’t think the GS40 was all that great. I changed my testing protocol a little since then, but on the two similar tests in both reviews, the Razer Blade performed better. Also keep in mind that the GS40 has a 2.5″ 7200rpm HDD, which consumes 1-3W depending on its usage. Add in the typical MSI 5-15% battery wear and it’s even worse than they advertise. There’s not many professional reviews out there on the GS40 unfortunately. Notebookcheck tested the battery and got similar results to what I did, with the 2015 Razer Blade testing slightly better in two categories(again, I don’t know how they test things). I’m also under the opinion that touch screens aren’t all that power hungry as people say they are. I’d like to see some real hard data on how much power they actually consume. From what I understand, it’s pretty much the same as a trackpad when it’s not in active use, which is almost nothing. On top of that, resolution no longer is the only driving force behind power consumption of panels. Sharp IGZO is very different than LG IPS, and it could very well be that 3200×1800 Razer panel is more efficient than the GS40’s FHD panel in some ways. They both utilize different backlighting and power saving firmware features, so it’s very difficult to say for sure which is better other than running battery tests at certain brightness levels. I don’t know. 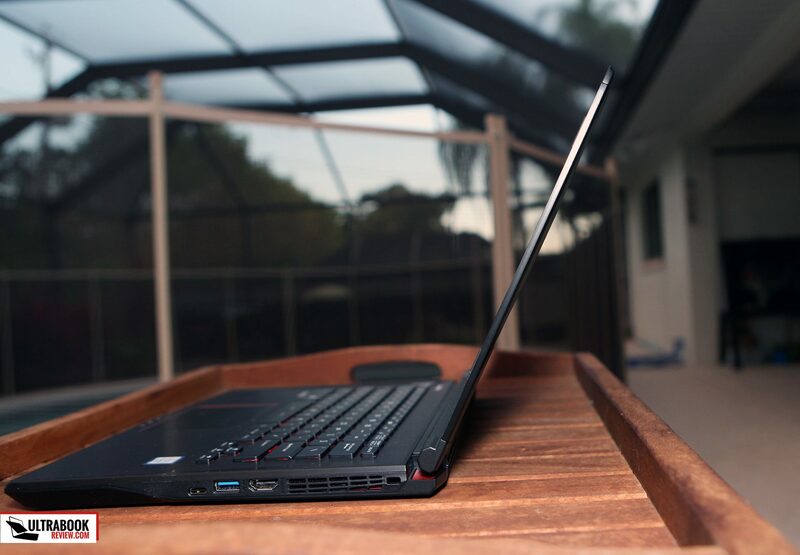 The GS40 isn’t bad by any means – I just wouldn’t pick it over the Razer Blade. If it was the GS60, it would still be a difficult choice for me but the GS40 didn’t seem as nice to me as the GS60, in my opinion. It felt cheaper than the GS60 and that keyboard issue I had was also pretty disappointing. Thanks. I just read that comparison article. I actually bought a msi gs60 6qe 4k and returned it because of screen bleeding. It was huge in size for a 15 inch laptop. Light thin but big, more like a 17 inch. It all comes down to small things. Dell xps is great packs a 15 inch 4k touch screen that is great for 2500 eur but a gtx960m. 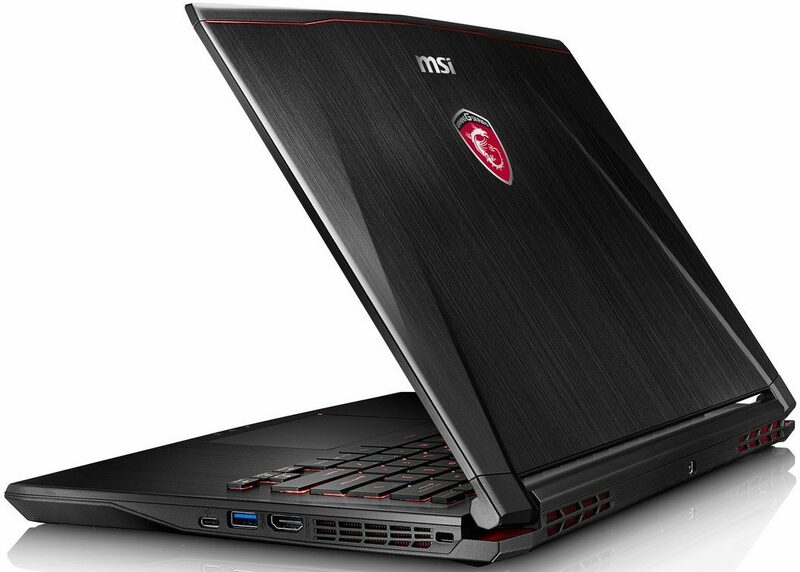 And msi gs60 is just too big for a 15 inch,appart from that a great laptop for 1500 eur. In the end the price difference in Europe makes me tilt towards the msi gs40,with xps as second choice for screen size. Too bad msi has such big screen breezel and xps does not pack a 970m. I ended up Buying the MSI GS63. So far I am very happy about it. The review I read are good. The fan is only noisy if you play games and the gtx1060 kicks in , otherwise the noise level is good. It runs fine nearly always above 50fps. The form factor is perfect for me too ( it fits in all my previous laptop bags). 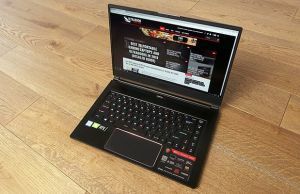 The gs63 is just 14.9 x 9.8 x 0.69 inches so unless yo uneed a touch screen this is a great lap[top. Yes it runs hot in the bottom while playing, so you need a desk or a support and while you play it is noisy ( but not anoyingly noisy.. and I play with headset anyway). I hope this comment shelps you choose the right machine for you. fair enough. I’ve been living with mine for quite a while now– the msi has gone overseas and cross country multiple times. the weight really is a big deal to me. the lack of ports on the razer, in addition to the weight is another deal breaker. there’s nothing as frustrating as going into a conference room with crappy wifi, and not being able to plug in without a dongle. on the other hand, yes, it is very annoying that razer can make a world class, almost “slim” charger, and msi can’t, but I just add that to the price of must-have accessories for the MSI. 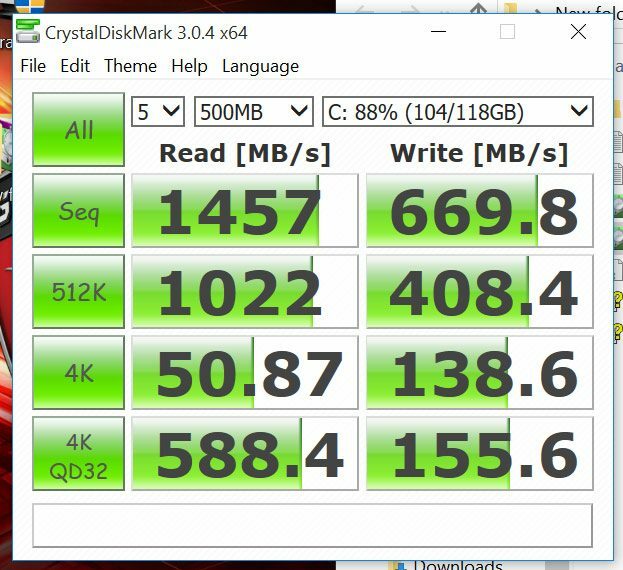 I Forgot about the spinning drive on the MSI, I opted for a 512g ssd from exotic, so that could be why I’m getting such fantastic battery life. There really is, IMHO, no reason to go for a spinning drive at this point. Maybe I’m nitpicking here, I just wouldn’t say there’s “no” circumstance in which you would go for the gs40. The razer is without a doubt what I would chose for a full-on portable gaming laptop. But if you need something that you’re going to need for work and for gamming, the razer is just too annoying. One more thing, there’s very little in the way of customizing you can do on the Razer. No exotic pc, I don’t even think you can opt for a different hard drive than what they give you. And forget about upgrading memory, it’s all soldered to the board. Anyway, both are great laptops. But for me, even where money was no an issue, I still went with the gs40. but is it still relevant today to buy one of those knowing that Nvidia 10…series are going out soon ? It’s a tough choice, knowing the 10xxm series is coming soon. The GS40 is an unknown at this point. The GS60 and GS70 are actually being replaced by the GS63 and GS73 but there are no indication of a refreshed GS40 coming anytime soon. I expect a late fall/winter release. If you can’t wait that long, then I’d say pull the trigger and get one now. you’re ALWAYS going to be facing that issue. I bought a haswell-e 8 core for my desktop last year, and NVidia 980s. I could have waited a year for the new 10-core chips coming on line soon or the NVidia chips. Buy now, and there’s still something coming down the road. It never ends. The Nvidia 970m is a great chip — from personal experience, plays just about anything you can throw at it at full settings. Now, with al that said .. If it were *me*, and I had a decent, working laptop, I’d wait until the end of the year and get the NVidia 10. these laptops are bleeding edge, and you pay for it. you may as well get the best. I don’t regret buying the 970m version, and I’m not going to run out and upgrade, but if you can hold off, I think it’s worth it.